Read my story about local landscape designer Dan Wanzung’s tips for creating beautiful summer containers and see his creations that grace a Wheaton home in the June issue of Better Homes & Gardens magazine. Read my story about the 7 environmental stations of Marcus de la Fleur of Elmhurst in the June/July issue of Organic Gardening. Pick up the March/April 2011 issue of Midwest Living and read about a fabulous tulip garden in Grayslake and Michelle Walsh’s neat sundial garden in Lake in the Hills that I produced. Read about Tamara Hughes’ St. Charles garden and Gail Snowwhite’s Elgin garden that I produced for the Early Spring 2011 issue of Country Gardens magazine. See the story on an Inverness family that I produced for the November issue. See 2 gardens I produced, a fall Japanese garden in Orland Park and a cute vegetable garden in Barrington. 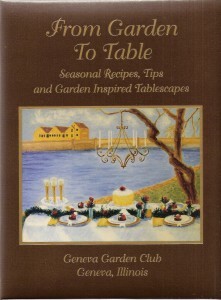 “From Garden to Table” features 250 recipes and garden hints from club members as well as local chefs. Read about the Jostrand Glen Ellyn garden that I produced for the BH&G publication Outdoor Rooms.